This article discusses a link that studies have found between a cluttered home and depression. The depression can cause the clutter or the clutter can cause the depression. If this is what you’re living with and feeling, send an email or pick up the phone and contact a professional organizer to help. Often getting started is the hardest part, but once you’ve started, you’ll be SO GLAD you did. Everything in your world will look less daunting and you’ll have a more positive outlook overall. Just as you’d call an electrician, plumber or go to the hairdresser, professional organizers specialize in teaching the process of decluttering and getting organized. We’re here to help! Let us. What better time to de-clutter and organize your holiday decorations than right now. After the house is decorated, take a good look at any items you chose not to display and decide if now is the time to pass them on to a new home. Look around your rooms and make a conscious decision about each and every decoration. Before disassembling, consider investing in new bins for storing your items throughout the year. Eliminate as much cardboard as possible and replace with strong plastic bins, especially those with rubber seals and locking lids. These will help ensure that in the event of an accident or flood, your decor will remain protected. Label containers with duct tape and a sharpie for ease in future set-up and tear-down. Finally, be sure to choose a place to store all holiday decorations (books, dishes, etc) that is as climate controlled as possible to avoid the growth of mildew or summer heat melting treasured items. *Appliances include: refrigerators, freezers, washers, dryers, stoves, furnaces, water heaters, air conditioners, dehumidifiers, heat pumps, microwaves. The process of de-cluttering can be easy or difficult, in part due to your attitude about it. Remember that all things have a useful life and when it's no longer useful to you, it can be useful to someone else. Don't be selfish and hold on to an item because you once loved it, even though you no longer need it. Respect the value of the item by passing it on to be useful to someone else. This approach should help in letting go of items that you no longer need or use, but are still in good condition. Focus on the end result. Instead of feeling badly about letting go of items, perhaps some still brand-new, focus on the positive. You're giving yourself the gift of a new space for a new adventure! The decision of donated versus sell depends on the item. High value, good condition items that are in demand can add extra cash to your new adventure (or pay for your Organizer). This process is more time consuming than donating, but can reap great rewards for the right items. Other items are best donated based on volume, size, or time constraints. Think of those less fortunate than yourself and help stock a place where they can get valuable and needed items. Finally, think of de-cluttering as a positive step to moving on and providing others with items they need. Once this attitude is adopted, you just may find that you enjoy de-cluttering! Often people call me to help with a space that they continue to plan to tackle, but once there, feel overwhelmed and don't know where to start. The first piece of advice is always to break large spaces into small spaces. Rather than look at a whole room, pick one piece of furniture to start with. Once there, pick one drawer or shelf. When will I use it again? If I get rid of this and find I need it again, what is the replacement cost? Do I have something else that serves this purpose? Asking those questions should help in the decision-making process. For items being kept, the next step is to decide if that is the right space to store that item. If they're office supplies and you're in the playroom, perhaps they go back to the office. Make piles of items to be delivered to different places in the house. Once done, decide if you're ready to tackle the next shelf, or take a break. If you're on a roll, keep up the momentum. If not, take a break! Don't work until you're exhausted. One step at a time. Before you know it, the space will be done! As an Organizer, I help in the decision-making process by asking these key questions and more, while also helping to decide which items to donate and where, before taking them to those places. Once de-cluttering is complete, I help decide how and where to best store items. This IS a difficult and draining process. An organizer can be helpful for reassurance that your decision is the correct one, speed the process by having two people sorting through items, keep up your spirits by having a partner in the process, and removing all donations, recycling, and trash so you can relax when you're done. Now you're ready. Where shall we start? I've recently had more and more people tell me that they just need affirmation that it's okay to let go of certain items. Too many of us hold on to items because of the people who gave them to us, rather than because we like and want the items. When faced with the question, "Does it bring you joy?" by Marie Kondo, author of "The Life-Changing Magic of Tidying Up", often the answer is "No." If the answer is not a resounding, "Yes! ", then it's okay to let go of the item. Allow the joy to have been in the act of giving. How many of us would want someone to hold on to an item we gifted that was not the right fit, or that someone just didn't like? I think we'd rather that person give the item to someone else who will truly use and appreciate the item. Also, how likely is it that the gifter even remembers giving the item? For family heirlooms and other like items, if they don't bring you joy but you don't feel you can donate them, snap a photo and text or email it out to family members and family friends. Be clear that you're planning to donate the item (but feeling guilty) unless someone claims it. Someone might be grateful for the opportunity to have the heirloom, or everyone may respond to get rid it because no one liked it in the first place. Result: Burden gone and problem resolved. The next time you find yourself keeping an item because of the person who gave it to you, ask yourself, "Does it bring me joy?" and let the answer decide if you keep it. Do you have too many clothes but have a hard time getting rid of any? Here are some strategies that might help. First, you need to know the last time you wore each item. In order to keep track, turn your hangers around on the dowel in your closet. Mark the date that you turned the hangers, either somewhere in your closet or on your calendar. If you use an electronic calendar, add it to the calendar so that you can search at a later date by the word "hanger". When you wear an item, replace it on the hanger and place the hanger correctly on the dowel. Once a full season has passed, and later a full year, if there are any hangers still facing the wrong way, those are the items that you haven't worn in at least a year. These are items that can likely be donated without you missing them at all. The only exceptions to this would be fancy gowns or suits that are special occasion items. At the same time you turned your hangers around, take the time to sort your clothes by style and then color. For example, put all tank tops together, then short sleeve shirts, long sleeve shirts, pants, skirts, and finally dresses. Within each type of item, arrange the clothing by color. This allows two things to happen: 1-You'll save time when you need, for example, a white short sleeve shirt. You'll know exactly where they all are and can quickly and easily find the one you're looking for. 2-You will see how many of each type item you have. After this sort, if you find that you have 10 white, short sleeve shirts, decide if you really need that many. Are any serving duplicate purposes? If so, keep the newest or your favorite, and donate the rest. Finally, when getting dressed, if you put on an item and think, "I just don't like the way it..." and immediately take it off, do not place that item back on a hanger or in a drawer. Instead, set it aside to donate. Put the item in a bag and place it near the door you exit daily. Allow this to be your donation bag until the next time you leave, and add to it with any other items from your closet or around the house. When you leave next, take the bag and put it where you can see it in the car. You'll likely pass a thrift store in your travels almost daily, so stop in and drop off your donation bag the next time you pass. Desk/kitchen junk drawer - every kitchen needs a junk drawer, but every junk drawer doesn't need to be disorganized. Dollar stores are a perfect place to purchase lots of different sized containers for kitchen, desk, and bathroom drawers. Use a long narrow container for pens & pencils, small square containers for rubber bands, paper clips, binder clips, and medium rectangular containers for pads of paper, etc. Garage/laundry room shelf - these shelves are often filled with various cleaners and supplies. For ease in finding what you're looking for, sort the items in groups such as floor cleaning, rags, dusting/polishing, lightbulbs, and laundry. Then, place each group in a labeled bin, or label the shelf, using a label maker, duct tape and a sharpie, or index cards and a sharpie. We can do all the organizing in the world, but until we change our habits, nothing will change. If you've gotten excited about getting organized in the new year, don't fall into two common traps: 1-Buying storage containers and other organizing bins falsely make us feel organized. Be sure to utilize them in a functional way after they've been purchased. 2- Setting up an organizing system, but not maintaining it. Force yourself to abide by the organization you've set up and make it become a new habit. For example: instead of dropping the pile of mail on the kitchen counter as usual, force yourself to throw away the junk mail, and file the rest in your new organizing system. You'll be happy you did! Changing habits isn't easy, but it is possible. Think about how much time you'll save by being organized. Make today the start of a new habit. Many of us put away our holiday decorations this past weekend. While doing so, I realized I should share the practice I put into place a few years after being in our current house. We are blessed in this home with lots of built-ins, several that we use for decorating. After figuring out how like I like the decorations set up, and which strands of garland, lights, ribbon fit each area, I wanted to make sure I could replicate it the following year. I now take pictures once all decorations are up, and put all strands of garland, lights and ribbon in labeled bags, such as "stair banister", "hallway banister", "outside tree". I even put a reminder on my phone for next December to take decoration photos in case I change things around. Use this for every holiday or season you decorate for, and you'll have quick easy setup each year. During this month focused on organization, I will be posting organizing tips and ideas on various social media outlets. How did January become "Get Organized Month"? In 2005, the National Association of Professional Organizers (NAPO) hoped to increase awareness of the significance of organization and empower people to get control over their possessions and time. Studies show that individuals waste up to an hour each day on average, searching for things that they’ve misplaced. This January, focus on time management and organization to start the year with solutions to improve your personal efficiency long-term. Charlottesville Organizing is committed to serving the community with hard work, honesty and compassion. When de-cluttering a space, we keep in mind the value to donating to those in need through local non-profit organizations. Items no longer able to be reused or donated get recycled whenever possible. Charlottesville Organizing takes a responsible approach with each and every client as well as with our community at large. Thank you for your support of Charlottesville Organizing in 2017! 2017 Charlottesville Family Favorite Award Winner! Thank you for your support and your votes! 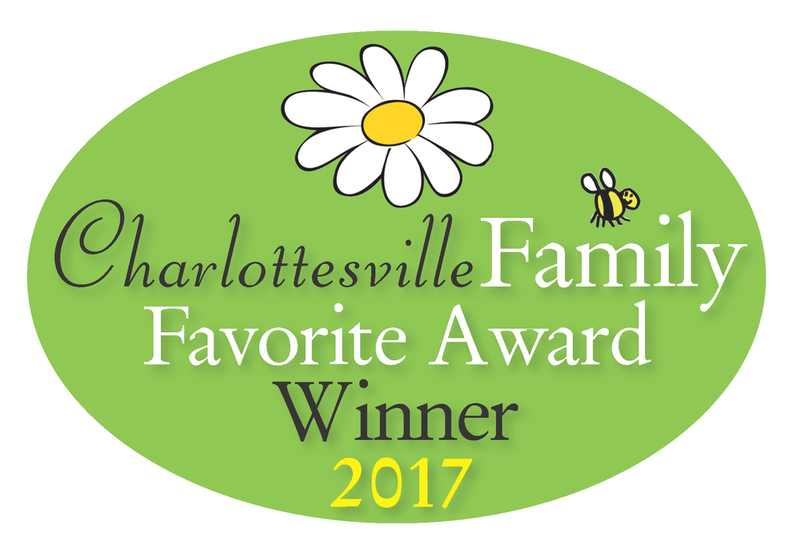 Charlottesville Family Magazine has named Charlottesville Organizing a Gold Award winner, voted by their readers as a family favorite in the category of Organizing Service for 2017. Thank you to everyone who voted to make this award a possibility! In many homes, especially those with school-aged children, the kitchen seems to be the place where papers end up gathering - school calendars, homework schedules, sports schedules, field trip forms, etc. If the kitchen is the natural place to keep them, consider concealing them inside a cabinet door to decrease "visual clutter" but keep them handy for quick reference. Tape papers inside a cabinet door or install cork board squares that mount with double-sided tape and tack the papers to the cork board. Do not overlap the forms. Post each separately for maximum ease of quick reference. Be sure to remove and recycle when completed. One Day Left to Vote! Voting for Charlottesville Family Favorites ends tomorrow, October 10. Please help Charlottesville Organizing remain a favorite for three straight years! Please vote Charlottesville Organizing as a Charlottesville Family Favorite business in town! Voting ends next Tuesday, October 10th. Please place your write-in vote on page 7, #14. 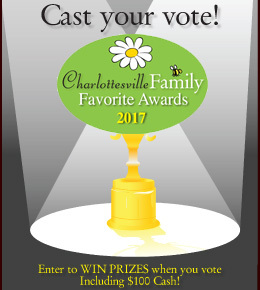 It's time for the annual Charlottesville Family Favorites voting. Since beginning in the fall of 2014, Charlottesville Organizing has been a winner of the Charlottesville Family Favorites each year. Help us win again! Please click on the following link to cast your write-in vote on page 7, item #14. You must complete 50% of the survey for your vote to count. 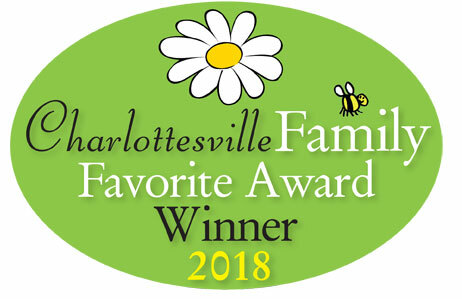 Thank you for voting Charlottesville Organizing as favorite in Charlottesville!